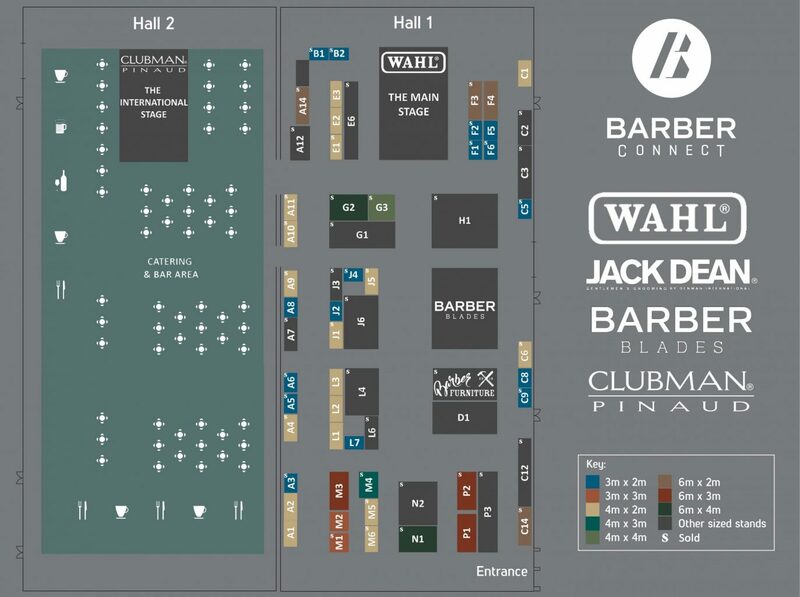 This form is for exhibition stand applications to exhibit at Barber Connect 2019. Please complete and submit this form immediately to avoid disappointment. Once your application has been completed you will receive an email to confirm receipt of your application. One of our team will then be in touch to confirm your booking. Please select your preferred stand size. Your stand size MUST INCLUDE all the space you require for your activity. This also includes any space required for audience to watch any demonstrations you might undertake. Management reserves the right to stop any demonstrations that attract a crowd bigger than the space that is available in your stand on the day for safety reasons. Shell scheme stands include 1x 13Amp Power Socket, Carpet, Exhibitors Lounge Access, Wifi Access and Tea & Coffee @ £218.50 + VAT per square metre. Corner stands will have two open sides/walls as standard. Space Only stands are required to submit full plans of their stand to the event management team for approval. Any stand over 3m tall or requiring flown rigging will be required to submit structural drawings. Space only stands include 1x 13Amp Power Socket, Exhibitors Lounge Access, Wifi Access and tea & coffee @ £195.50 + VAT per square metre. 1. Payment of a 25% deposit is required within 30 days of the invoice date with the balance paid by 1st April 2019. Bookings will not be confirmed until full payment of the deposit has been received. Refunds will not be possible after the 25th April 2019. 2. The event management reserves the right to cancel any day or days of the event if required. 3. The event management cannot be held responsible for the effects of bad weather, national mourning or any other natural disaster. 4. Any equipment hired from the event management is the responsibility of the vendor for the duration of the event. All equipment must be returned in good working order at the end of the event. If for any reason any equipment is not working correctly the vendor must let the event management know immediately. 5. The event management will not be held responsible for the loss of any stock as a result of equipment, power failure or theft. 6. The event management reserves the right to refuse entry to the licensed premises throughout the event. 7. The deposit of 25% will be retained if the vendor cancels their booking in advance of the event. This rises to 100% after 25th April 2019. 8. All costs are subject to VAT. 9. Floor plan and stands are subject to change.